Good afternoon Berkeley Parents, Monday is the last day of the first marking period. Students may still complete any missing work until grades are posted on Tuesday. Please have students get with their teachers ASAP if there are still missing assignments. Tuesday, November 7th is a student holiday. Teachers will report but students are home for the day. All 7th and 8th graders must have a current sports physical (Dated on or after May 1, 2017) to try out. Also, students may not have more than 1 F on their report card. Order your Berkeley spiritwear today! The online store closes Nov. 9th. Check out the new designs! They make great holiday gifts! 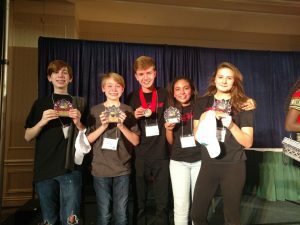 The BMS team took top honors (1st place Overall) and 5 of the cast members received individual acting awards. (4 Best Performances out of 6 given among all conference participants and 1 All-Star Cast out of 20 given) We have received the gold award at VTA 7 times in 8 years attending. The theatre group will have an in school performance this Friday during school. Congratulations to Mrs. Gallant’s theatre students who took home 4 top performance awards and 1 who took home the all star cast. The overall group took home a gold award. 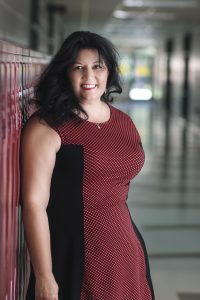 Mrs. Gallant took a group of students to the VTA and came away with top honors as well as being named the Virginia Theatre Secondary Schools Division Chair.